Interest in English wines continues to grow apace. This year’s English Wine Week from 23 – 31 May, promises to be a great celebration of the wonderful 2014 harvest and the opportunity for us to learn more about growing and making wines in cool climate England and Wales. We have always been keen to support and show just how good English wines can be. As part of English Wine Week was have arranged for Paul Langham owner of a’Becketts Vineyard (and immediate past Chair of UK Vineyards Association) to join us to provide a special English Tasting/Meet the Producer event on 29 May 2015. Paul will talk us through “From Vine to Glass” as we taste a selection of wines from a’Becketts, Chapel Down and Ridgeview with accompanying English Cheeses from Cheese & Chutney in Emsworth. Book early to avoid disappointment! There really is a spring in the step of English Wine producers. Since 2008 the amount of land under vine has doubled and now accounts for around 2,000 hectares. According to the UK Vineyards Association there are now 470 vineyards in England and Wales. 2014 was a record-breaking year, with perfect weather from a warm spring and summer to a fairly dry September/October. The result was a fantastic harvest of healthy grapes which produced around 6.3 million bottles. At least two-thirds of English production is sparkling wine amounting to the equivalent of 4 million bottles last year. However, to put this in perspective the UK imported 32.7 million bottles of champagne in 2014. English Sparkling wines can compete well on quality and price (with Champagne) in the £20 – £28 bracket; this quality is reflected in the great achievement of 10 Gold Medals in the International Wine Challenge (IWC) this year. As everyone knows England experiences weather! It is difficult to predict an average harvest in terms of quantity and quality. Compare the dismal 2012 harvest of around 1 million bottles (equivalent) of variable quality with the bumper 2014 harvest! 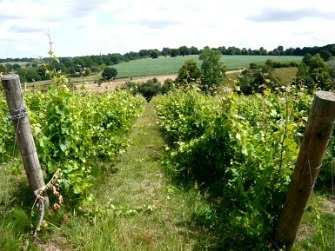 People often bemoan that English wines are no cheaper than champagne, but vineyards are expensive to run. One owner has estimated that it costs at least £125,000 per hectare for the first three years before you see a single-harvestable grape! The good news is that we have people who are prepared to invest in English Wine production and some talented viticulturists and wine-makers who are making it happen! We should experiment with our taste buds and support good English Wines!